As I was putting together my Met preview post, I thought to myself, “so much Donizetti!” So I fired up Excel and made some charts. 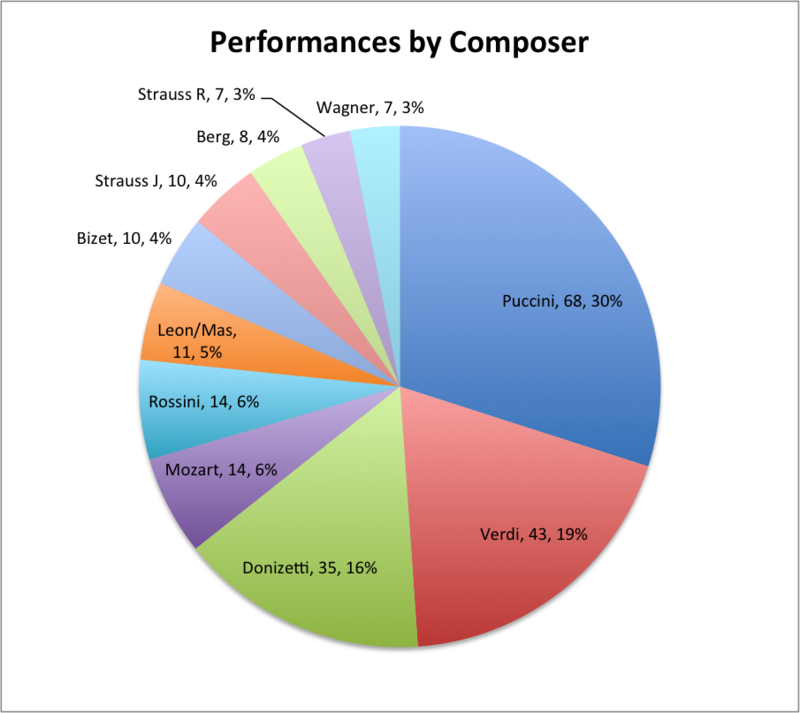 The above pie chart shows numbers of productions by composers. There is a lot of Donizetti. 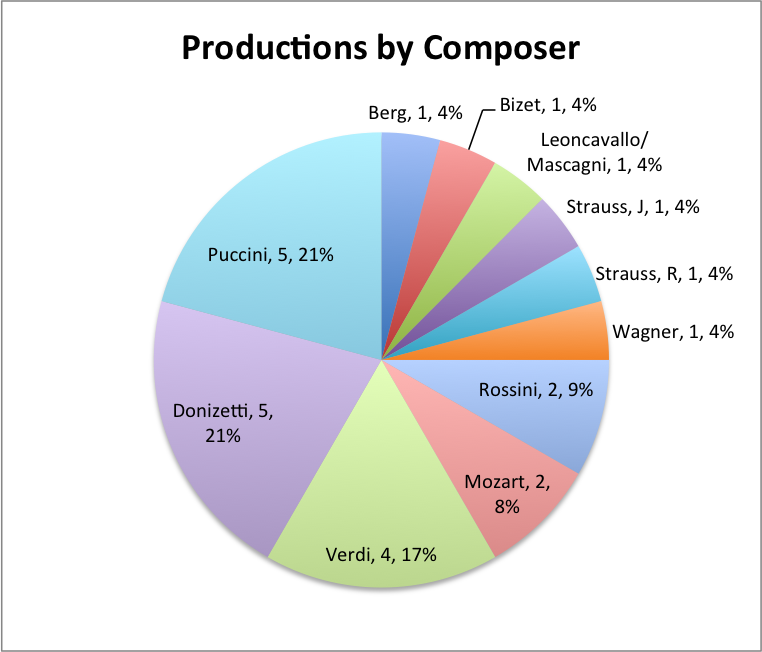 He and Puccini are tied for first by number of productions. I like Donizetti just fine an d the Three Queens Not-a-Trilogy (Anna Bolena, Maria Stuarda, Roberto Devereux) is a one-off special occasion. But I’m not sure if he merits more than twice the number of productions than Richard Strauss and Wagner put together. Donizetti operas must sell, though I suspect this is not based on the composer’s name recognition. These operas are either star singer vehicles (the Not-a-Trilogy) or frothy comedies (the other two, Don Pasquale and L’elisir d’amore). Also, they’re far cheaper to produce than Strauss and Wagner. You know what else sells? Puccini. If you count performances rather than productions, you will find that Puccini is occupying the Met for many more performances than Donizetti. Both Puccini and Donizetti—along with Verdi, who is next in line after these two—represent a mainstream American idea of what opera is. Not the most interesting idea, in my opinion, and one that would benefit from including more music from other time periods and traditions. 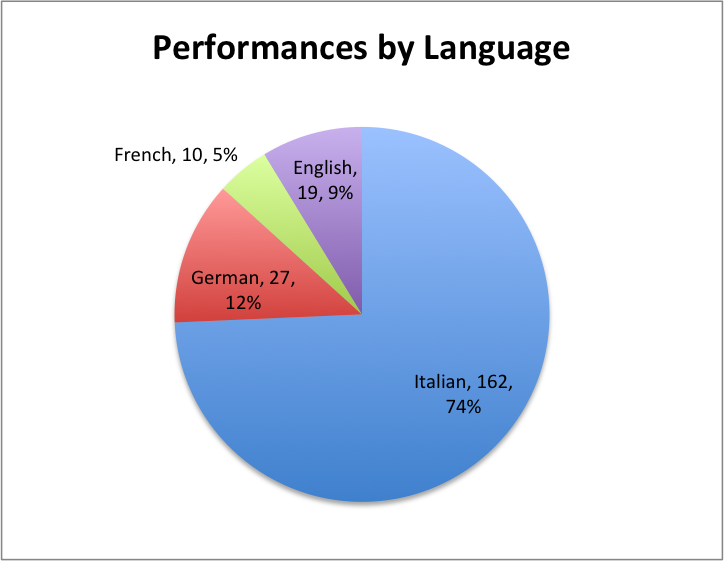 Here is a chart showing things by language. I love Italian opera but this is ridiculous. Just to reiterate some absences I’ve already noted: there’s nothing composed after 1935 (all due respect to Friedrich Cerha, the completer of Lulu) and no Slavic repertoire. Notes for the pedantic: Simon Boccanegra is accounted as the second version, Tannhäuser is the Paris version, Cav/Pag dates are averaged to 1891, and Lulu is dated at 1935 because that’s when Berg stopped writing it and putting its date off until the three-act premiere in the 70’s seemed excessive. Turandot, however, is given by its premiere date of 1926 like the rest. If you find this grossly unfair, make your own chart. I've been following these things lately and I'm surprised to see how little Wagner is actually performed.